Pity the North American owner and trainer with a top-class 3-year-old on grass. A Breeders’ Cup title is rarely in their future. Neither is an Eclipse Award championship likely. Possession of such an animal, no matter how good, usually must be its own reward. In the combined 66 runnings of the Breeders’ Cup Turf and Breeders’ Cup Mile, only four U.S.-trained 3-year-olds have carried the day. Neil Drysdale won one of each with War Chant and Prized, while Shug McGaughey took the Mile with Lure and LeRoy Jolley won the Turf with Manila. As far as the Eclipse Award goes, at least during the Breeders’ Cup era, 3-year-olds Sunshine Forever, Itsallgreektome, and Kitten’s Joy had records impressive enough to earn championships, even though a Breeders’ Cup title escaped their grasp. This is a long way around to an appreciation of the two 3-year-olds who bookended the major turf action over the weekend. 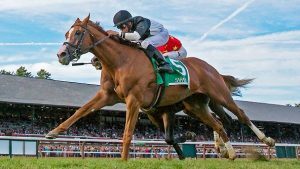 Voodoo Song, a son of English Channel, won his fourth race of the Saratoga season in the Grade 3 Saranac last Saturday. Then on Sunday, Sharp Samurai, by First Samurai, completed his sweep of the meet’s best division races in the Grade 2 Del Mar Derby. Whether or not we hear from them again, they always will have the summer of ’17 to remember. Both races were at a mile and one-eighth, and each test afforded the winning jockeys a chance to tap skill sets perfect to the task. In the Del Mar Derby, Sharp Samurai appeared to have nothing on opponents like Bowies Hero, winner of the restricted Oceanside, or Big Score, the Transylvania winner who had not run since the Belmont Derby, while Fashion Business and Colonist had been lapped on Sharp Samurai in the La Jolla. Given a loaded gun by trainer Mark Glatt, Gary Stevens did his classic wait-wait-pounce routine on Sharp Samurai, surging past Big Score, Bowies Hero, and Colonist in about a dozen strides, then maintained his advantage to the wire. At Saratoga, Jose Lezcano once again let Voodoo do that which he does so well, which has been to run the opposition ragged in frustrating pursuit. After stretching his lead to more than half a dozen lengths between calls, Lezcano kept pedalling hard enough to hold off the proven stakes horses Yoshida and Bricks and Mortar to win by a neck. Sharp Samurai could have been claimed for $75,000 last February, when he won a maiden race by more than nine lengths, but he wasn’t. Likewise, Voodoo Song was risked for a $40,000 tag running in his first turf race in eight months, on the first Saturday of the meet. He proceeded to win by more than five. Voodoo Song was making his first start for Linda Rice, who took charge of his training upon the retirement in July of Mike Hushion, Schwartz’s New York trainer for a quarter of a century. Four days later, Voodoo Song won again, in New York allowance company, then added a third straight on Aug. 23. 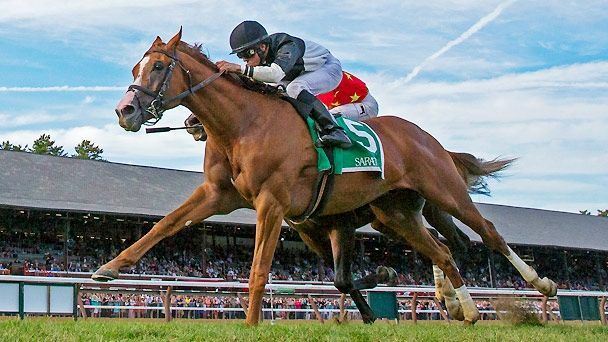 As a former chairman of the New York Racing Association, Schwartz said there is no place else he’d rather win a race as Saratoga, let alone four with the same horse. “The funny thing is, without him I would have gotten the duck for the meet,” Schwartz said, summoning the hoary racetrack term for a shutout. “But four wins is four wins, no matter how you get them. Voodoo Song has a long way to go before legendary status comes knocking. First, he’ll have a few more chances to run against his own kind this season before reality hits next year. It should be noted, however, that Fourstardave didn’t win his fourth race at Saratoga until he was 5. And not for nothing, Fourstardave was a chestnut with a long blaze bred in New York, and Voodoo Song is a chestnut with a long blaze bred in New York. “You can only hope,” said Schwartz.